For the price of the Iraq War, we could've bought each lolrus a dozen of the most valuable buckets in existence. 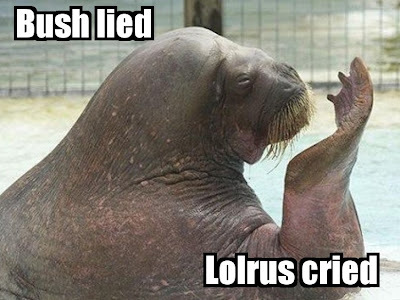 The lolrus, actually an southern elephant seal named Minazo who lived a Japanese aquarium, achieved immense internet fame due to a famous captioned image of him having his bucket taken away by an aquarium attendant. A popular series of captioned photos concerning the putatively unhappy lolrus and his quest to regain his bucket soon followed. There are about 600,000 southern elephant seals in the world. A George 111 mahogany and brass peat bucket was bought by John Magnier for 169,000 Euro and is believed to be the most valuable bucket in the world. Buying 12 such buckets for each southern elephant seal would cost $1.73 trillion, which is less than Joseph Stiglitz and Linda Bilmes' estimate of $3 trillion for the cost of the Iraq War.